Unchecked ambition can lead a man to do strange and horrible things. In Shakespeare’s Tragedy of Macbeth, the titular character murders a benevolent king, his own best friend, and an innocent family so he can sit atop the throne. It’s a dark, damning, and disturbingly accurate critique of human nature and the willingness to set morality aside in order to pursue power and wealth. SERIOUSLY FUNNY : Rick Miller’s cartoon-inspired rewrite leaves roughly 50 percent of Shakespeare’s script intact and is about 85 percent true to the original story. The changes turn tragedy into comedic gold. In the case of virtuoso voice actor Rick Miller, the ambitious actions were decidedly less horrible, but they were still a bit strange—cartoonish even. It all started with a bit role in a small production of the same regicidal play. “You don’t get much of a chance to shine as Murderer No. 2 [in Macbeth],” Miller explained in a phone interview with New Times. The young actor wanted more spotlight, so he essentially “killed” the other 18 characters in the play and assumed their roles for himself. To Miller’s credit, it was kind of an accident, and The Simpsons helped. It was 1994, the height of Simpsons mania, when Miller put on an impromptu performance at a cast party using spot-on impressions of Homer, Marge, and Flanders in a scene from the play. It was a hit. The other actors encouraged him to refine the routine and take it to the Montreal Fringe Festival, where a low-budget act could get plenty of exposure. His success in Montreal allowed him to form his own company, WYRD Productions, and take the show on tour. A lot of the humor is derived from the simple pleasure of hearing the revered, Victorian language in the drunken voice of Barney Gumble or the polished tones of Troy McClure. Miller includes as many voices as possible, often splitting a single role among several characters to allow 50 Springfield residents on stage. Patty, Thelma, Skinner, Moe, and the Sea Captain all take turns as witches, for example. Still, MacHomer is much more than Simpsons characters reading an old script. It’s been revised to include songs and gags, and the casting choices add new elements to the play. CARTOON COMES ALIVE : Rick Miller has the stage all to himself in MacHomer, but he gets by with a little help from animated clips, music, sound effects, and a puppet show. Miller described Homer as the stupidest Macbeth to ever grace the stage. He forgets his lines, blunders about, and gets distracted. Where Macbeth was haunted by visions of a bloody dagger, the dripping, wedge-shaped implement reminds Homer of a piece of pizza. Homer’s buffoonery seems a drastic departure from the determined but guilt-ridden Macbeth, but there are similarities between the two characters. Both are prone to fits of violence, and both crave material comfort. The idea of lording over a castle with servants ready and willing to whip up a fresh batch of pork chops at 2 a.m. is a sentiment that suits Homer just fine. He just wouldn’t want to work for it. While themes of vaulting ambition, fate, and guilt are impossible to remove from the story, Miller freely admits that MacHomer is not the ideal adaptation for those seeking to explore the psychological depths of Macbeth. Instead, this production is geared more toward making people laugh and introducing Shakespeare to a generation of young people who often aren’t that eager to embrace the bard. “A lot of people say they hate Shakespeare, but they quote him every day,” Miller said. Shakespeare’s influence on Western culture—even worldwide culture—is difficult to overstate. It’s been 400 years since he died, but his plays are still performed in multiple languages on stages across the globe and have been retold and referenced in countless novels, movies, and, yes, cartoons. The bard literally invented swagger—not the style, per se, but the actual word “swagger.” It didn’t exist prior to the penning of A Midsummer Night’s Dream. According to shakespeare-online.com, the playwright added a staggering 1,700 commonly used words to the English lexicon by routinely repurposing old words as new parts of speech, linking words with hyphens, adding prefixes and suffixes, and simply making things up as he wrote. 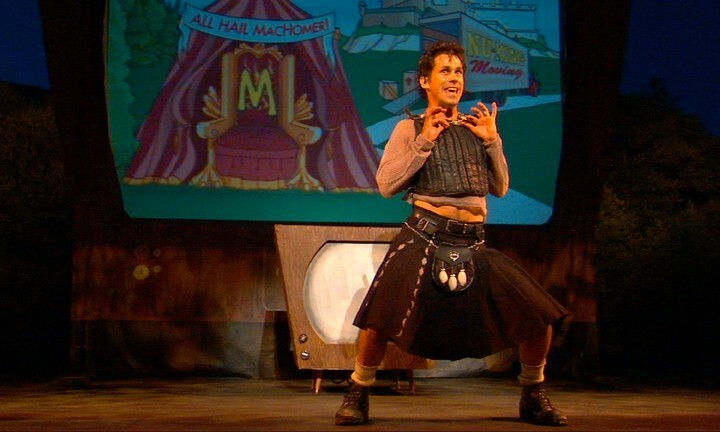 MMM … SHAKESPEARE: MacHomer, a retelling of Shakespeare’s Macbeth, features voices from more than 50 Simpsons characters, and can be seen Nov. 7 at 7:30 p.m. at Cal Poly’s Cohan Center. Tickets range from $16 to $38 and can be bought through calpolyarts.org or by calling 756-2787. Or they could just watch TV. Oddly enough, no one has continued Shakespeare’s tradition of redictionalizing like the writers of The Simpsons, who created succinct and precise expressions for anger (d’oh!) and indifference (meh) which can now be found in legitimate dictionaries. The show has also given us less common, but perfectly cromulent words, such as “embiggen,” “craptacular,” “sophistimicated,” and “neighborino.” The list goes on, hilariously, at simpsons.wikia.com/wiki/Made-up_words. Despite rave reviews from the L.A. Times, the New Zealand Herald, and more, Miller has encountered some criticism from people who shudder at the thought of hearing Shakespeare’s immortal words dragged through the mud of crude cartoons. They believe that high art should be placed on a pedestal, admired for its superiority to popular rubbish, and kept unchanged. Miller disagrees. Calendar Editor Nick Powell plays the saxomaphone while jumping on the trambampoline. Contact him at npowell@newtimesslo.com.